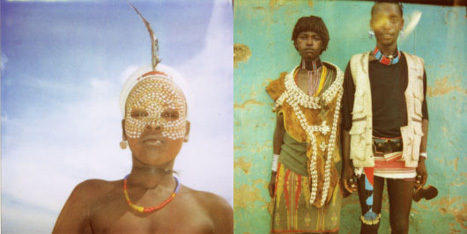 Ethiopia from olivia wyatt on Vimeo. Filmmaker Olivia Wyatt went to Ethiopia to document the music of 13 different tribes for her a film on tribal Music on Ethiopia. 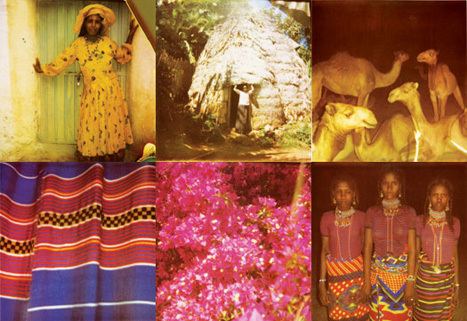 Along with the film, she took some Polaroid’s of her experiences with the locals. The shots somehow found my inbox via two sources. See more on pages 46-54! I thought they were very worthy of note, and well fairly re-emphasizes my claim about photography that the camera doesn’t matter. olice men with guns at my window. Directly behind them, a mini-bus was completely turned over and the police were angry that we were traveling illegally at night, so they took us all to a tiny jail in the mountains and we were told we had to stay there until sunrise. Everyone was staring at me; they would look in my direction and whisper and laugh, or some just stared, even the police. I decided to just go and talk to the police. I asked them questions about their life and told them what New York might be like at 4 a.m. and the next thing I know, they let us go. The entire bus was chanting “forenji, forenji, forenji!” [foreigner]. Source! Indeed Forenji! The only thing is that she thinks Forenji means foreigner, it does and it doesn’t the origin is actually not foreigner but French and its used to describe white people not all foreigners. I think! But what a story , and what great photos! Published by Nolawi March 2nd, 2010	in African, Design and Social. The hyena licking the guy is so disgasting! T feel hyena are the ugliest animal on earth. Ferenji doesn’t even mean French. It is not an Amharic transliteration of the word “French”. It is an older word borrowed from Arabic which in that language refers to European or white people. The Arabic form may even come from another language, I don’t recall at this point…. You are both right. I was curious about the origin of the word when I read Salmon Rusdie, in his books, refer to foreigners as Ferengi in Hindi. “In the 10th century, the Old French Franc was borrowed into Arabic as faranji, where it was used to refer to European traders. This was possibly borrowed into Persian as farangi, and then into Hindi-Urdu as farang? (??????? ?????? ), romanized as firangi, ferengi or feringhee,….” I think this is where we got the word as well. know .i ve 4 years ago .im hear .sound .some people took with me .but he is not.stand .my front .i never see bing.phisically .24 houres he is speaking with ..me he is chenge . by women sytail .sound.women. jest devilsm .sprite . i afect with eny one without .resien .but i doent .made something.i doent .know how to can solive .until .im live with this bad sprite .no solition. so if you ve eny aidea please give.me idvaice. but know .i ve plan .retern in ethiopia . make holy tsevel. i blive i will get good hell . my health . .im not semoker. i dident this much luke drink.alcol. im verey ager .long time espended . with my lover .but by this cause .im not hold. grilfirend . One forenji saved the whole passengers from the police harassment, just like the avatar movie. Interesting!!! in any country foreigners usually have interetsing perspectives. but sometimes, especially when they don’t understand what’s going on around them, they also write some weird stuff. like, when exactly was it illegal to travel at night in Ethiopia? Was this written pre 1990s, during Dergue curfew times? And even back then, the punishment for breaking curfew laws was being kept in what sounds like yeqebele jail till sunrise? sounds sweet, if u ask me. Right you are, one has to only read James Bruce’s version of Ethiopia to find out how wierd the understanding of foreigners in a country can be. I remember reading how “Abyssinyans ate the flesh of a live cow, and had orgies” in his book, years ago. (I kid you not). I guess if we want truth to be told we’ve got to write our own history books. Just a heads up, Ferinja in Arabic means European, they use the word to refer to white Europeans. Maybe the amharic version originated from ancient Arabic? I most certainly will be incorporating this to my list of social book marks. There is clearly much to learn about it. I think you’ve made some good points also features. Hello buddy, was just wandering through the net search some stuff and came upon your blog. I am striked by the posts that you own on this website. It displays how well you know this subject. Bookmarked this blog, will get back for more. You, buddy, ROll!!! CatholicSingles.com has been the internet meeting place for Catholic singles since 1997. So far thousands of Catholics who might not have been able to meet, have joined us. As a wholly owned Catholic company we offer unique benefits such as dating and fellowship with other Catholic singles, a custom Catholic compatibility test, weekly advice columns, and links to other authentic Catholic content and resources. Heya we’re for any principal occasion in this article. I discovered this kind of plank and I to uncover It really beneficial & this taught me to be away significantly. Hopefully to present one thing once more and also enable other people just like you made it easier for my family. I say to you, I certainly get irked at the same time as other folks consider worries that they just don’t recognize about. Thanks a lot for providing individuals with a very breathtaking possiblity to read critical reviews from this web site. It is usually very lovely plus stuffed with a lot of fun for me and my office fellow workers to visit your web site really 3 times every week to read the latest secrets you have got. And of course, we’re at all times motivated with all the great suggestions you serve. Certain 3 areas in this article are undeniably the best I’ve had. i am visiting this site dailly and take good infrormation from here every day. page arre inn fact remarkable for people experience, well, keep up the nice work fellows. of this piece of writing, in my view its actually amazing iin support of me.